This sample of informational text comes with 6 paired questions. While the reading level and questions are geared towards middle school, this is also appropriate for remediation at the high school level. The questions focus on standardized reading skills, such as comprehension, figurative language, and inferences. 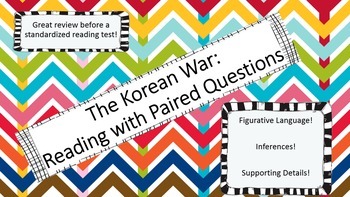 Students will apply these skills to history content about the Korean War, making it appropriate for Language Arts AND Social Studies classes. This corresponds to Virginia SOL USII.8C.